Fire season is the pits when you are a TV journo working near a national forest. When I worked in Oregon, it was the same thing. You could spend weeks out near the fire line updating people on how close the flames were getting to homes and watching fire crews work like the wind to contain a raging beast. When I did my first stint at WATE seven years ago, a photog and I went up in a black hawk helicopter with the then-governor of Tennessee, Don Sundquist (I think he was in office ,..wow my memory is getting bad) to survey forest fire damage. The Army guys had taken the door off of the left side of the chopper for better viewing. I had a coat on and gloves but man it was freezing! The flight pattern over the disaster included a few dips so we were almost on our side looking over the charred land through the open door. The photographer with me was so scared that he'd drop his camera out of the helicopter that he strapped himself and his gear in. He could barely move. We didn't capture the greatest video that day but the assignment left such an impression on me. Fire in a forest is a powerful, destructive, deadly force best noted from an aerial position. One of the warriors against such disasters is author Philip Connors. He is a fire watcher in New Mexico. During the summer months he packs up his gear, leaves his wife and sets out with his dog to a remote camp with a cabin, cistern for water and a massive fire tower where he watches for smoke from nine to six everyday. 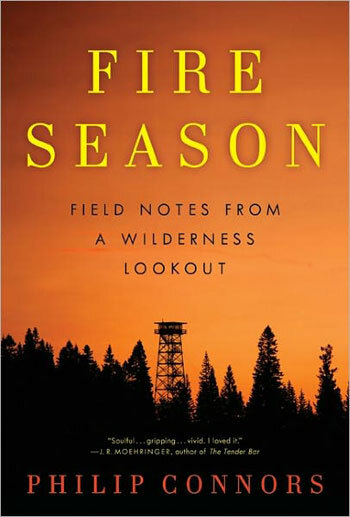 His book is called Fire Season (2011) and gives an account of his job role which is certainly countercultural but essential for the life of our ecosystem. Connors admits that people think he is strange. He gets completely jazzed about his sojourn into the forest, hiking seven miles from where he parks his truck which is driven many more miles on dirt roads to reach civilization. He knows the lay of the land like the back of his hand after many years of fire watching. I love the accounts of him sometimes literally running into nature during hikes with his dogs. The most interesting aspect of the book to me is Connors' dissection of solitude. As a Cancerian (star sign) I can be typical when it comes to time in my shell. I adore hours of laying in bed alone reading, not checking email or answering the phone... but it must take a special person to live in silence except for a few radio transmissions daily for months.